A new system for dealing with 999 calls for ambulances in Wales has come into force. Emergency response time targets will be scrapped for all but life-threatening cases during a one-year trial. Calls will now be graded and it is estimated 10% of the 420,000 ambulance emergencies a year will be coded “red” for the most critical. Welsh Ambulance Service chief executive Tracy Myhill said the new system was based on clinical evidence. “These changes are about putting our sickest patients first,” she added. Meeting the targets has been a long term problem for the Welsh Ambulance Service. The latest figures out on Wednesday showed a drop in performance after seven successive months of improvement. In August, 58.8% of emergency responses to life-threatening category A calls arrived within eight minutes – below the 65% target and down from 61.7% in July. Managers argue the current against-the-clock system can lead to two vehicles – a rapid response team followed by an ambulance – going to what often turns out to be a less critical case. But as soon as it is clear a case is life-threatening, an emergency vehicle will be sent. Voice recognition software which identifies key words will be used to help screen calls and identify critical cases. But when it is unclear how serious a call is, control centre staff will have extra time – up to two minutes – to judge how to respond. Paramedic and nursing expertise will also be available over the phone. Until now, about 40% of 999 calls have been classed as life-threatening and categorised Red 1 and Red 2 – the former being the most critical, such as heart attacks and where the patient has stopped breathing. 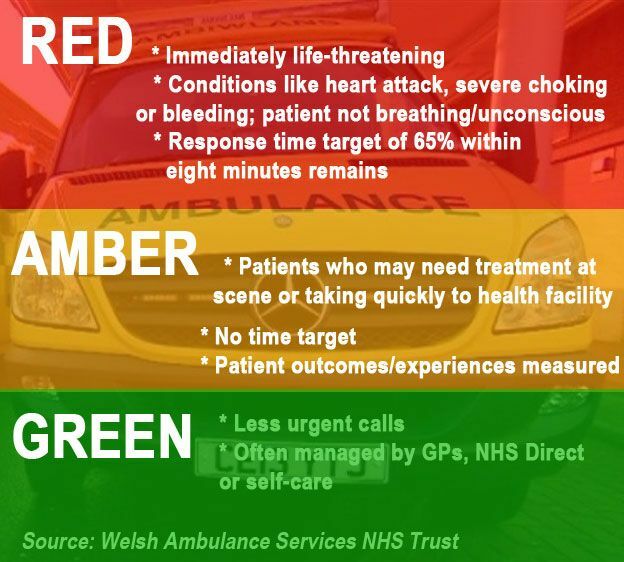 In future, under the traffic light system, the trust estimates 65% of 999 calls will fall under “amber” which may still see ambulances dispatched, but not against the clock. However, managers say the quality of patient care, including the outcomes, will still be measured in quarterly figures. Another 25% are expected to be graded “green” and could end up being dealt with by GPs or NHS Direct instead. Opposition parties have accused the Welsh government of political expediency by changing targets, which follows a review into the under-performing service two years ago by a health economist. Plaid Cymru called the trial a “dangerous experiment”.